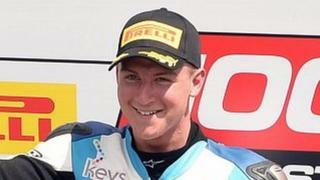 Fermanagh motorcycle racer Josh Elliott expresses his delight after finishing second at Silverstone to clinch the British Superstock title with one round of the series to go. "I didn't realise I had won the championship until I came round the last corner," said the Morello Racing Kawasaki rider. "I'm glad it didn't go to the last round - to clinch it at Silverstone was my ultimate goal," added Elliott, who now hopes to step up to the British Superbike class or move to compete at European level.